Fake tan for body by Sunjunkie, the UK’s largest collection of self tanning products for body application exclusively available online at Sunjunkie.com. Sunjunkie offer fake tanning products for body applications to suit all skin types from gradual, light, medium and dark shades. All Sunjunkie fake tanners for body are available as a self tanning mousse, tanning mist or self tanning lotion and are suitable for clients with a fair skin tone to a dark olive skin tone. 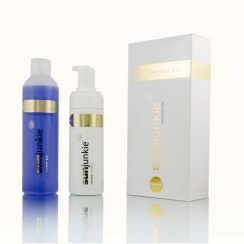 Sunjunkie fake tan for body products are infused with the finest deep skin penetrating moisturizing ingredients and blended with natural tanning agents to create the perfect self tan application on the body. Our self tan for body collection is specifically blended for facial application and is non greasy with no added oils.